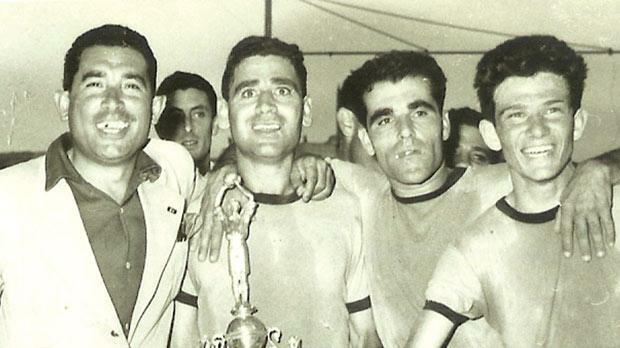 The jubilant Sliema players after winning the 1956 FA Trophy. 1955 was a golden year in the career of one of Malta’s greatest and most-loved players as Tony Nicholl, captain of Sliema Wanderers and Malta, celebrated his 25th year in football. Sliema paid tribute to their stalwart. An organising committee was formed. Receptions were held, matches played and the climax was reached in a dinner dance when the club presented their captain with a cheque for £300 (one could buy a small house with that amount of money in those days) and other presents donated by nearly all the other league clubs. However, the biggest present the Blues could give to their captain was to make that season the most memorable in their history. Sliema started on September 28, 1955 when they beat Floriana 2-1 in the Cassar Cup final. Then, they continued on the winning trail on December 18, 1955 by beating the Greens 1-0 in the Scicluna Cup final. That season Sliema practically ran away with the league. No one could dispute the fact that the Wanderers deserved the honours. Enthusiasm, hard training and a slice of good luck gave the Blues the league pennant. They had to win the FA Trophy to complete a quadruple in honour of their captain. In May 1956, Leyton Orient, winners of the Third Division (South) of the English Football League, marked their promotion with a successful tour of Malta. UK teams are an attraction and this tour was no exception. The tourney, however, played so late in May, ate up the last few remaining cool days of the season. Therefore, by the time the Orient tourney was over, the hot weather had already crept in and the FA Trophy that year was played in the sweltering heat of a Maltese summer. With the first three major trophies already on their mantle-piece, Sliema were determined to add the FA Trophy to their collection. Showing their intentions from the start of the competition, the Blues ousted Ħamrun Spartans 3-0. Floriana cantered through their quarter-final tie with a 4-2 victory over Rabat while Valletta knocked out Hibs 2-0. Vittoriosa Stars, although already relegated, beat Birkirkara 3-2, showing that they did not deserve to return to the Second Division so quickly. The Stars’ cup adventure came to an end in the semi-finals. They were outplayed by Floriana who beat them 3-0. Sliema also found little opposition from Valletta, winning 4-1. It was, therefore, another Sliema vs Floriana final. It seemed at the time that there was no other team capable of breaking the Old Firm’s grip on the trophies. The game itself was no classic. The heat of the afternoon made the players feel drowsy. Indeed, play was slow and without inspiration. At the end, a corner by Sliema right winger Charlie Mattocks somehow beat the Greens goal-keeper and floated into the net to give the Blues their fourth honour of the season.